East Croydon, defined as the station and the surrounding area, is at the heart of the Central Business Area of the London Borough of Croydon. It is also an important interchange for rail, tram and bus services. 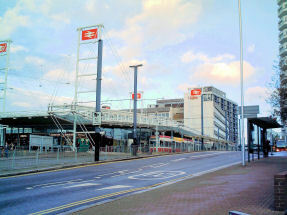 East Croydon is dominated by modern developments that provide offices for national and international companies. However, major shopping centres, retail outlets, car parking, hotels, conference facilities, restaurants, bars, night clubs, cinema, theatre, market, park and residential properties can be found within 15 minutes walk of the station. Rail links provide direct access to London Bridge, London Victoria, Gatwick Airport, Luton Airport and Brighton. A frequent and direct service to St Pancras International is also available for Eurostar services to France and Belgium. A dedicated rank for licensed taxis at the station allows visitors to be taken on to their destination almost 24 hours a day. A satellite image of the area, with road map overlaid, is available from Google™. This also provides directions to and from the area. This web site is intended to provide businesses, visitors and new or potential property owners or tenants with information about the area and the features it has to offer. Please note that much of the information and service details provided are subject to regular review and may change in the future. Always check with the appropriate sources for current details.